My son’s pockets used to be full of acorns: he collected them at the bus stop, but I don’t know if it was because he planned to feed the squirrels, or if he thought he was a squirrel. Later, he moved on to rocks. 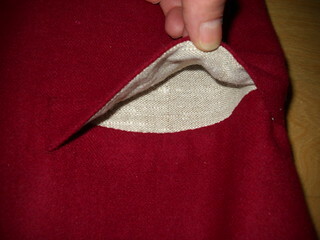 Now, rocks, fish hooks, a pocket knife, change and a hankie fill the pockets of his 18th century breeches. We’ve had some moments of unhappiness when things have gone missing from the pockets, though we’ve usually found them again. When you look at the contents list, you wonder how the linen stands up as well as it does. There’s a clever way to upgrade pocket bags in menswear, and it’s authentic: leather bags, instead of linen. Original garments have leather bags, probably deerskin, and they’re deliciously soft and very durable. Stuff all the heavy, sharp things you want to in that pocket, and it will probably take it. Based on a suit in the RIHS Collection, I decided to modify the pocket bags on the Young Mr’s new workman’s jacket-in-progress, which I plan to have finished by March 11 for HSF #5, Peasants and Pioneers. 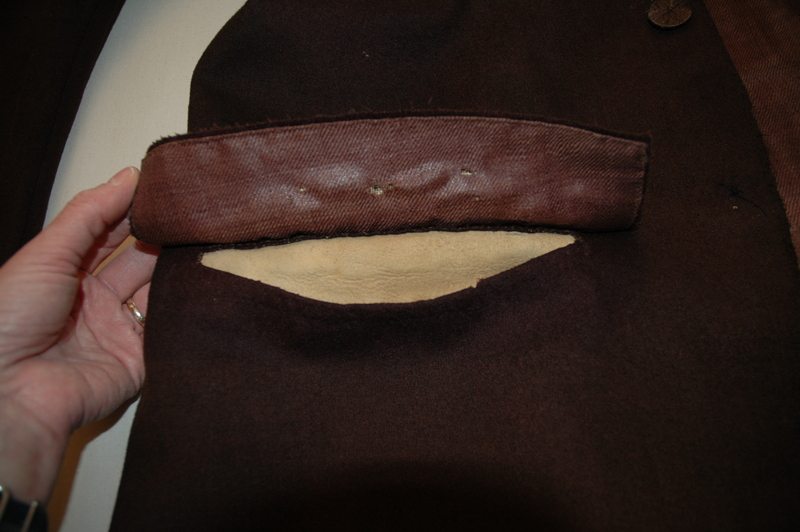 Made of a heavy, rough-finished brown broadcloth (possibly manufactured in New England), both jacket and breeches pocket bags are made of deerskin. To recreate this, I took a trip to the auto parts store, and purchased a large chamois. 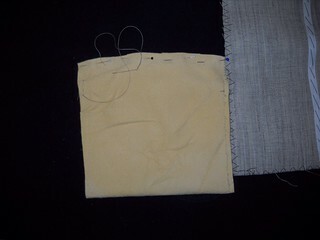 Instead of cutting the bags from linen, I cut them from the chamois and trimmed the seam allowances: chamois won’t ravel, so the seam won’t need to be folded over at the top. I backstitched the bag seam, and in general, I’m pleased with the way it has turned out. I think I’ll look into additional leather options, but otherwise, it seems like a fairly successful experiment. The real test, of course, will be user testing. How many sharp, heavy things can the kid load in a pocket before it gives out? Wow! I just replaced the flannel bags on my vintage German winter coat, worn out from all the keys stuffed in them by the previous owner. Had I REALLY been thinking I would have tried out the auto parts store for my lining, although I might have had trouble using the bags for MY stuff, which include suede gloves! Can’t wait to see your HSF#5! I’ve been doing a lot of contract sewing involving buckskin – and I’ve ended up with a bag full of leather scraps. If you’d like, I can send you some to try and play around with. 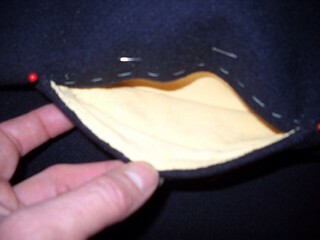 You’ll have to hand sew it, but I have plenty of pieces to use for a small pocket like that. thank you so much! that would be amazing, really! I hand sew by preference anyway, so rather than asking my friend who hunts … well, I have no way to deal with a hide … I would love to take you up on the offer. email me your address to sarah_nucci@yahoo.com and I’ll drop some in the mail.